It is the simple math of recession. Consider housing, which is typically a major factor in recessions. At the peak of the last boom, Americans were spending $813 billion a year on residential investment. That figure bottomed out last year at only a $327 billion….Since hitting its low ebb, residential investment spending has rebounded only slightly, to a $336 billion annual rate this past spring. That means that, mathematically, it would be impossible for a new housing downturn to be as powerful an economic drain now as it was over the past several years; there isn’t $500 billion worth of housing activity left to vanish. million a year, meaning that there is not as much room to fall if waning consumer confidence again leads Americans to become ultra-cautious. This is an argument that several other people have made in somewhat different form. Brad DeLong frequently points out that housing has been underbuilt since 2006 far more than it was overbuilt in 2000-05. So there should be a lot of pent-up demand for new housing. 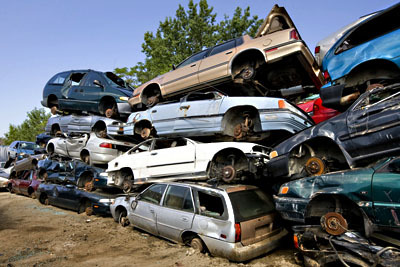 Likewise, Karl Smith has pointed out that the U.S. auto fleet is aging, and as old cars get scrapped more people will be forced into both the used and new car markets. So the auto market is likely to pick up. This all makes sense, with one caveat: no matter how much they want them, people will buy new houses and new cars only if they have the money. If they don’t, they won’t — at least, not in the same dollar volume as they did in the past. Cash income, mostly from wages and investments. Credit, mostly from auto loans, HELOCs, and credit cards. Savings. You have more money if you draw down savings, and less if you boost your savings rate. So what’s the size of each of these components? The answers are pretty easily available from public sources, though not always as quickly as we’d like. But there’s a problem: I don’t think it makes much sense to look at the overall aggregates. You need to know the distribution. The top 10% of wage earners make so much that fairly small changes in their supply of money can swamp fairly large changes in the bottom 90%, and that can be badly misleading. Why? Because changes in the top 10% don’t matter that much: their spending on ordinary consumer goods doesn’t change a lot when their incomes go up or down by modest amounts. So what I’d like to know is the size of those three components solely for the bottom 90%, the segment of the population that’s more sensitive to changes in their supply of money. For wage income that’s fairly easy to come by, but I don’t know if it’s available for the other pieces. So here’s my question to the economic community: Are these numbers available? If they are, how do they compare to 2000-07? And what does the trend look like? Or, alternatively, am I overthinking this? Are the gross aggregates actually perfectly good indicators of the spending power of the American consumer? I think that looking just at the bottom 90% would be useful, but maybe I’m wrong. Anyone care to weigh in?